A custom windscreen is a vinyl material used to fence out wind and create privacy, while still allowing a controlled amount of light in. Ok, So What’s a Custom Windscreen For? What Type of Material Should My Windscreen Be? Windscreens have a variety of uses. Maybe you’ve got a tennis court that is getting too much wind, or you need some privacy to hide that atrocious backhand. Maybe you’ve got a construction site that needs shielding from prying eyes while still displaying the construction company’s name and a beautiful display size image of what the finished location will look like. If so, you’ll need a windscreen. Maybe you’re a baseball or softball coach and would like to honor your tleague sponsors this season with a prominent spot on your outfield fence. If There’s Custom Windscreens, Are There Standard Windscreens? Great question. In a way, there is no such thing as a standard windscreen, because a windscreen can be built to any length. However, there are standard windscreen heights, and measuring your windscreen to one of those heights can help save you a lot of money, because you won’t have to pay for wasted screen that you’ll never use, or even see. To ensure a snug, wrinkle – free fit, you’ll want your windscreen to be about 4 inches shorter than your fence height. For instance, if your fence is 6 feet in height, you’ll want your windscreen to be 5 foot 8 inches. You can order your windscreen to any length, however for longer windscreens we recommend dividing your screens in to 50 foot lengths for easier installation. For longer screens, we also recommend ordering multiple windscreens at shorter lengths so if a section becomes damaged, you don’t have to replace the entire run. So you’ve measured your fence, and determined the standard size of the windscreen you need for that perfect, wrinkle-free fit. The next step will be deciding the type of windscreen material you need. The durability of the windscreen is affected by weight of windscreen material. Windscreen material is measured in ounces. The higher the number, the heavier the material, the more durable the windscreen. If your windscreen is going to be used in a temporary application, like a construction site, or event, you can use a lighter weight windscreen. For instance, a 5.5 oz windscreen is the lightest weight windscreen material that we offer. If you’re looking for a windscreen in a more permanent location, like a tennis court, you’ll want a more durable option, like a 14 ounce material. The durability of a windscreen can be improved by the addition of features like wind flaps and box vents. Having these features placed every 10 feet or so can help reduce. Most windscreens range in opacity from 70 – 84%. Another important consideration for your windscreen is color. Not all windscreen materials are offered in a variety of colors, so you may have to consider how important the color of your windscreen is against other factors like durability, privacy, and cost. As a general rule, the heavier the weight of the windscreen material, the more expensive the windscreen. Windscreen warranties can range anywhere from 2 – 7 years, so if durability is your main consideration when buying a windscreen, be sure to check the warranty options. Because windscreens are available in a variety of material options, there are a variety of methods available for printing on them. If you need a logo, company name, or other design or picture on your windscreen, be sure to find out which method is being used on the windscreen material you’ve chosen. Your logo, design, or photo can be printed over the entire windscreen, however the images will fade after just a couple of years. Pro Tip: The full screen digital print is a great option for baseball outfield windscreens, since sponsors will need to be renewed seasonally anyway. There are a variety of windscreen features that can add to the durability and lifespan of your windscreen. Let’s take a look at these features so you can best determine which ones you need and which ones you don’t. Center Line Lacing Lips are a hemmed row of reinforced fabric that runs the length of the windscreen right down the center. By giving you additional attachment points, this feature can help reduce the amount of wind whip on your windscreen, greatly improving the lifespan of your windscreen. Pro Tip: If you’re using your windscreen in a high wind area, we strongly recommend adding the Center line Lacing Lip to your windscreen for added durability and longevity. Wind Flaps are another feature that can help improve the durability of your windscreen. By allowing more wind to flow through the windscreen, it helps reduce the beating a windscreen will take by ongoing winds. Box Vents provide similar functionality to a windscreen by allowing air to flow through it. Box Vents, however, are hemmed so are less prone to tear. They’re more expensive than wind flaps so we recommend using them on more durable windscreens that are intended for years of use. You’ve taken your measurements, chosen your material, added features, and decided whether you need an image on your windscreen. In other words, you’re killing it. But now it’s time to install your windscreen. 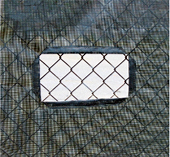 Most windscreens feature a hemmed border and grommets spaced every 18 – 24 inches and are typically installed on existing fences. Usually zip ties can be used to attach the windscreen to the fence. A more durable attachment option are hog rings. Hog rings are more expensive than zip ties, and also require a pair of specialty pliers. 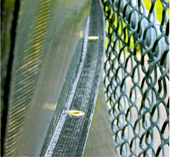 Windscreens are typically installed by attaching them to existing permanent fences, usually with zip ties. However, you can also install a simple frame like t-posts in the ground. The more posts you have, the more support for your windscreen, which will greatly help improve the lifespan. Can Windscreens be left out year round? How do I properly measure for a windscreen panel on a chain link fence? You’ll want to measure from attachment point to attachment point. For instance, on a chain link fence, you don’t measure from the top of the pole to the bottom of the pole on height but rather from where you’ll be attaching to screen to the chain link fence on the top and on the bottom. Often times that attachment point measurement is much different than the overall coverage of the chain link area. Keep in mind that if this is going near a natural grass, you’ll want to take off a few inches on the bottom to account for mowers & trimmers so they don’t hit the bottom of the screen. What’s the best way to store panels when they’re taken down during winter? Rolling the windscreen is definitely the best way to store when not in use. Always avoid creasing the fabric. We’ve had customers use PVC piping as a storage method to avoid the panels being crushed and to keep them from collecting dust. 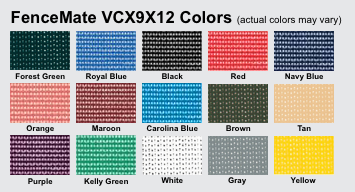 The higher end or more expensive materials are available in these colors. The less expensive are typically not. Please check with any sales associate for info on available colors for each material. What is the point of the grommet strip? The grommet strip is used as an extra connection point. For example these always run parallel to the length of the panel and are typically added to panels taller than the standard 5’8″H or 6’H height. The strip can be added to any height. If you have a 9’H panel without a center grommet strip, there will be no center support to connect the panel to the fence. 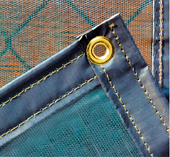 Adding the lacing lip or grommet strips reduces the strain on the perimeter hem and ultimately helps to extend the overall life span of the screen. What are the most popular windscreen materials? The most popular are the EnviroScreen, Tuffy, and ArmorMesh materials. These all have longer life-spans and are available in almost any color. Can logos be printed on the windscreens? Yes, any type of logo can be printed on the screen. Most are applied as a stitch on logo. If you’re needing a logo that takes up the whole panel, digital logos are available on select materials. They are ArmorMesh, Tuffy, and EnviroScreen. For the ArmorMesh and Tuffy, you get to choose the base panel color and the entire front of the panel will have a digital print. On the EnviroScreen, it uses a different process. We start with either a solid white or black panel and the entire front is printed to the desired base color along with the requested logo. This leaves the back of the panel a solid white or black color, whichever was the starting color of the panel. What are the warranties for the different brands? These cover any manufacturing defects but don’t cover any wear or damage occurring naturally from the sun and wind. Do all windscreens come with grommets around the perimeter? Yes, all windscreens come with grommets around the perimeter as a standard feature. What’s the spacing on the perimeter grommets? How long does it take to build a screen? The lead time to build will vary through the year. The busy seasons are Spring and Fall. The lead time during those seasons can be 3 to 4 weeks (15 to 20 business days). During less busier periods the lead time typically goes down to 2 to 3 weeks (10 to 15 business days). Please contact any sales associate to discuss the current timeline on a specific material. Will I be able to see through the screen? Since windscreens are designed to block the wind, they are not designed to be see through. You’ll be able to see movement behind the panels but you aren’t able to see any detail. What panel sizes can I get? These are the standard heights but you can get any of these panels in basically any height. The exception is panels that are too short. Typically anything shorter than 2’H. Is chain link fencing necessary or can I attach to just a steel frame? 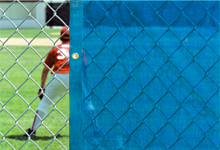 The panels aren’t required to be installed on a chain-link fence. It’s definitely recommended but not completely necessary. You can just create a perimeter frame and attach to the inside. Smaller panels or smaller frame sections would be ideal if you don’t have a chain link backing. If you have an area taller then 6’H, then you may want to build an interior support frame section running parallel to the length at around the midway point. You can then add a grommet lacing strip to attach additional zip ties to that interior support pole. For windier areas, you’ll definitely want to add box vents or vent flaps to help alleviate some of the wind pressure. What do you recommend to clean? You can simply use water, mild dish soap, and a soft bristle brush. A hose with a nozzle works best – DO NOT use a pressure washer. Cleaning with water, dish soap, and a soft bristle brush can also be applied to screens with logos. For larger screens you can use a push broom in place of a soft bristle brush. What are the box vents and vent flaps used for? The vent flaps are used to help alleviate the wind pressure applied on the panels. By adding these vents, you allow more air to pass through the panel which reduces the amount of pressure put on the perimeter hem. Box vents along with the grommet strip or lacing lips help to extend the life span. The box vents don’t have the flap portion and are cut out rectangles. 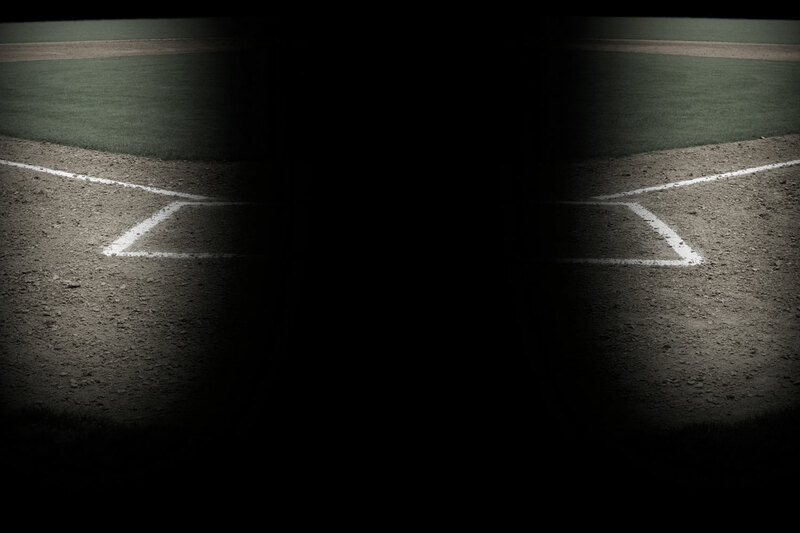 These are convenient for coaches since they create viewing boxes that allow vision through the screens. What’s the best way to attach to a fence? The standard method and easiest method to attach to a fence are zip ties. These are heavy duty zip ties which help to stand up to the high pressure wind can create on the grommets. This entry was posted in Windscreens, WindScreens. Bookmark the permalink. Follow any comments here with the RSS feed for this post. Post a comment or leave a trackback: Trackback URL.